Reliance Jio announced two new prepaid plans for JioPhone users priced at Rs. 297 and Rs. 594 on Thursday. Jio provides five prepaid recharge packs for JioPhone, a 4G-enabled mobile phone offered by the telecom major. according to the company's website - jio.com. These prepaid plans work only if the mobile SIM card is in a JioPhone device, said the private sector telecom company. Complimentary subscription to Jio apps is also bundled with all the recharge plans. Under the Rs. 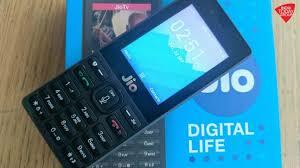 49 plan, Reliance Jio is offering unlimited calling, 1 GB of high-speed data and 50 SMSes for 28 days. However, after the consumption of 1 GB, the speed gets reduced to 64 Kbps. The plan is valid for 28 days. Under the Rs. 99 plan, Reliance Jio is offering unlimited calling, 14 GB of high-speed data and 300 SMSes for 28 days. The daily high-speed data usage is capped at 0.5 GB after which the speed gets reduced to 64 Kbps. The plan is valid for 28 days. Under the Rs. 153 plan, Reliance Jio is offering unlimited calling, 42 GB of high-speed data and 100 SMSes per day. The daily high-speed data usage is capped at 1.5 GB after which the speed gets reduced to 64 Kbps. The plan is valid for 28 days. Under the Rs. 297 plan, Reliance Jio is offering unlimited calling, 42 GB of high-speed data and 300 SMSes for 28 days. The daily high-speed data usage is capped at 0.5 GB after which the speed gets reduced to 64 Kbps. The plan is valid for 84 days. Under the Rs. 594 plan, Reliance Jio is offering unlimited calling, 84 GB of high-speed data and 300 SMSes for 28 days. The daily high-speed data usage is capped at 0.5 GB after which the speed gets reduced to 64 Kbps. The plan is valid for 168 days.